Today, I restored a 1930s (?) Marathon lever filler. Nothing special about this one, except for the very bright green celluloid found under the layer of black grime that reduced this to a $1.50 pen on ebay. I have quite a group of restored Marathon’s in my collection. I was initially drawn to them by their name and the tie-in to my hobby of distance running. I then discovered that Marathon’s, Morton’s and Morrison pens can be quite good pens if they have survived somewhat intact through the years. They all carry the distinctive “M” on the clip. Little is known, or shared, about their origin. I know it was in New York and lasted for several decades. I also believe there is a tie in with Nassau and Roxy pens. All of these are classified as “second or third tier” pens. This recognizes that they were not the premier pens of their day. This was reserved for Parker, Wahl, Waterman, and Sheaffer. However, some of the second and third tier pen makers put out some outstanding pens that are a pleasure to use today. This pen is a green lever filler, that required quite a bit of internal and external cleaning. The clip and nib (a Warranted No. 4) were covered with a black grime. The internal j-bar was intact and reusable. So, I cleaned it all up, knocked out the nib and feed, and cleaned them. I put it all back together, installing a size 16 silicone sac. I use silicone sacs on these bright plastic pens to prevent discoloration in the future, as the sac begins to age and decompose. 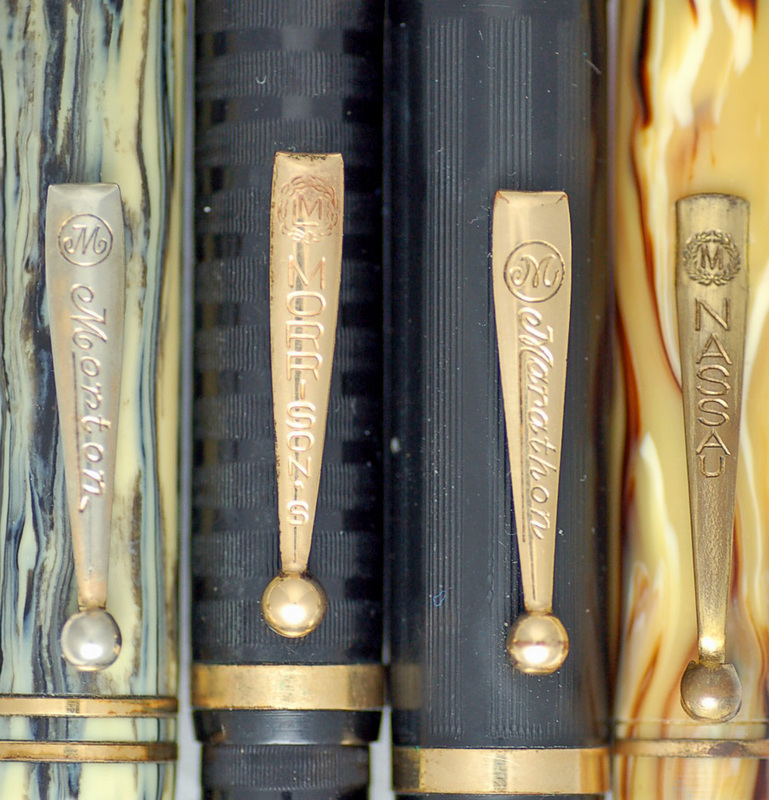 It is a shame these were not used in the past, as so many beautiful pens are discolored as the sacs and ink inside have reacted with the pen bodies and caps to ruin some great color patterns. I have some Parker Green and Marbled Duofolds that have been restored to almost new condition, but the discoloration keeps them from being outstanding specimens. Here is a picture of the finished product, along with a close up of the distinctive M clip and bright celluloid material. As soon as the sac cement dried, I filled this up with Waterman Blue-Black and it is now being used in my rotation — third tier or not!